Some of you may be surprised seeing that I am flying on British Airways considering that 1) They are not a partner of Delta Air Lines and 2) Aren’t you flying in South Africa? 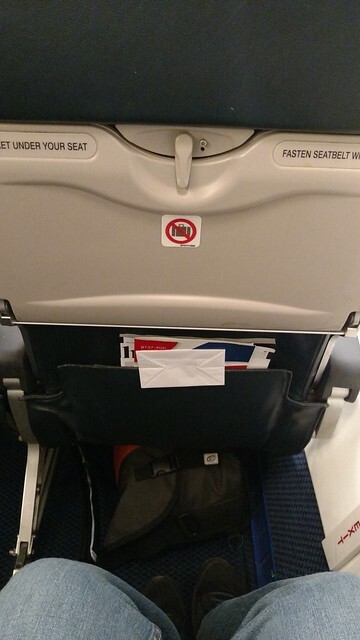 Yes, I decided to fly with a segment on a carrier that did not have a connection to Delta, but then Delta does not have any partners flying domestic South African flights. The only two “major” airlines are South African Airways and British Airways, with two LCCs that are owned by the majors, Mango and Kulula respectively. You are also probably sitting there thinking how British Airways is one of those airlines. 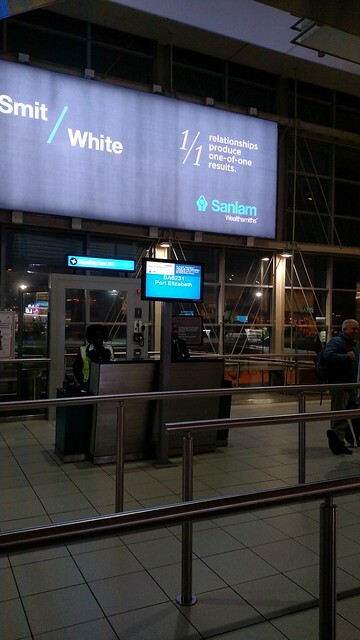 Well actually, its a franchised-operation run by South African airline Comair. This means, Comair crews and planes, but painted in British Airways livery and service onboard. With the worst flight in South Africa though being no more than about 2 hours, really with status or no status I’m sure any airline would be fine. It’s not like you’re stuck on the plane for 9 hours with terrible food, no legroom, etc. 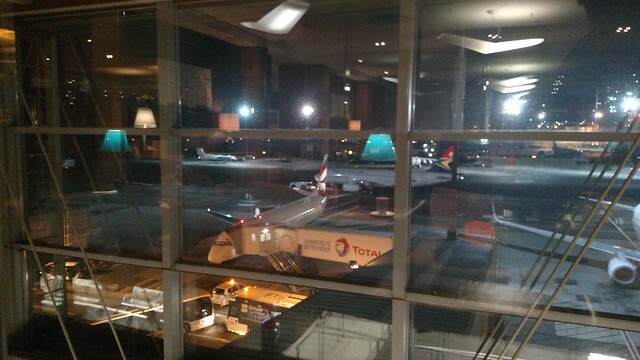 I arrived at the airport from the Hilton Sandton getting there by way of Uber, and made my way to the Domestic British Airways check-in desks. Surprisingly with it being around 5AM and with my flight at 6:30AM there was no one at any single British Airways counter. While there was a line at the “bag drop” line, due to my Oneworld Sapphire status, I made my way to the Club (Business Class) check in and was the first in queue. Over the next 15 minutes staff would start trickling out and start setting up their stations. Soon enough though I was checked in by the agent who tagged my bag down to Port Elizabeth and handed me my boarding card. From there it was through security, which was located just opposite of the British Airways counters, and thus one did not have to walk far. I didn’t see if there was a priority lane or not, but it definitely wasn’t busy. Work your way through the queue, get your boarding pass scanned, go through the detector and there you airside and ready to hit a lounge! Let me preface this section by saying, the two SLOW Lounges that I visited in South Africa are easily in the top of airline lounges that I have been to anywhere in the world. 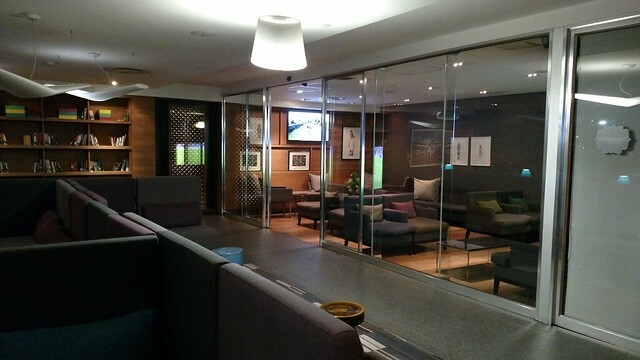 Yes, some of Delta’s Sky Clubs are nice and I love the KLM Crown Lounge in Amsterdam, but this one in Johannesburg and the one in Cape Town just were phenomenal. First of all, the SLOW Lounge is run by Comair and is for use by British Airways passengers (in Business Class or with BA/Oneworld Status) as well as a few other groups of people (I believe if you do business with a particular South African bank, for example). So therefore, I had no issue getting into the lounge – I handed over my boarding pass and my Air Berlin Gold card (thankfully they sent me an actual card after status matching me!) and I was let in. There was no wait or line to get in, and I made my way into the lounge area. Upon exiting the reception area, you enter right into where the food offerings are, and a few small sitting areas around it. 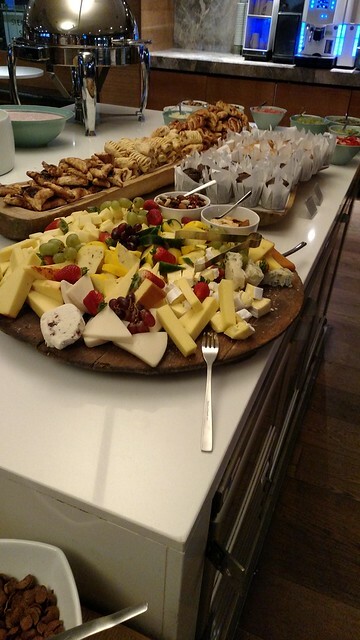 I was quite impressed with the spread that they had here – if only Delta would follow something similar for in the mornings with the Sky Club. If they did that, I would actually consider getting a membership again! There was almost everything that you could want: many assorted pastries, fresh fruit, cheeses and meats (if the European breakfast is your thing), yogurt, nuts, cereals, and more. On top of that you had your choice of self-serve coffee and tea, but also with a final twist: the bar area in the morning had a barista working an espresso machine. So if you fancy a legit espresso beverage – latte, cappuccino, or just an espresso, they are more than happy to make it for you. 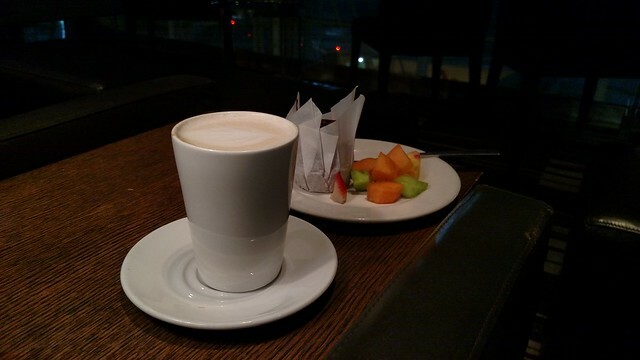 It was definitely much better than going with the automated machine beverage of usually never-that-good coffee, and was definitely a nice touch that made the lounge feel classier. Speaking of classy, this lounge most definitely felt warm, comfy and modern, unlike so many sterile feeling airline lounges. The lounge is broken into roughly four areas – the entrance area with some seating and the food spread, the bar area, a large sitting area on the other side of a wall featuring self-serve wine machines with plenty of over-sized comfy chairs and a few tables, and a quiet room for those that need that extra bit of sleep or just to block out the noise of the lounge. Which speaking of, while the lounge never got crowded, I will say even with a good few people there it didn’t get ridiculously loud. Of course though, while most people stayed in the area near the food, I found myself on the opposite side of the lounge where just a few of us sat waiting for our flights. One of the features that I thought was neat was that the SLOW Lounge features a sharing library; there was a good few books on the far wall that you were more than welcome to take with you on your trip, but that they encouraged you to bring it back to that or another SLOW Lounge. I wonder how many people actually take advantage of that – or even would know about that. Of course, there was also the “usual” selection of magazines and newspapers for one to grab if they so desired as well. I didn’t see anything that quite piqued my interest and with a relatively short flight, I figured I’d just stare out the window. 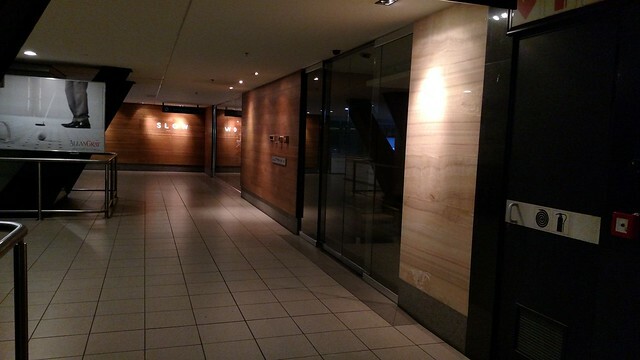 I left the lounge a little before boarding, which actually turned out to be the closest gate to the lounge. This meant I go there and found myself getting to stand around and waiting. The only thing is that I never was able to find a premium boarding lane and found myself in a zig-zagged queue where they have you line up prior to boarding. It’s kinda like a free-for-all version of what Southwest does. Considering how empty the flight was, there wasn’t exactly a fight for overhead space or anything and boarding didn’t take long. As such, it didn’t really where you were in boarding. Of course, I had no idea of this until I got to the gate and only saw a small group of people there. If I had to guess, there was maybe 30-40 people max on the flight that morning. Even with such a light load, we didn’t leave early. In fact, from the time most folks boarded we continued to sit at the gate waiting until our allotted departure time. 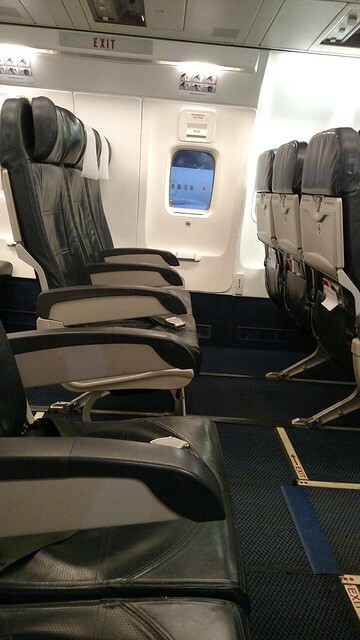 Which wasn’t so bad, as I was in an exit row, with a window and there was no one else in my row. 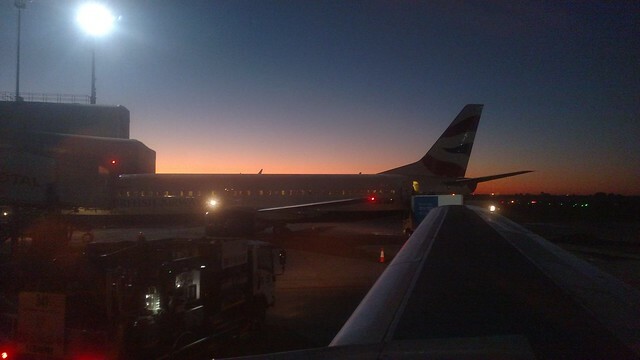 I stretched out, and watched the sunrise over the other British Airways 737 parked at the next gate over. It felt like this journey was getting off on a good foot! 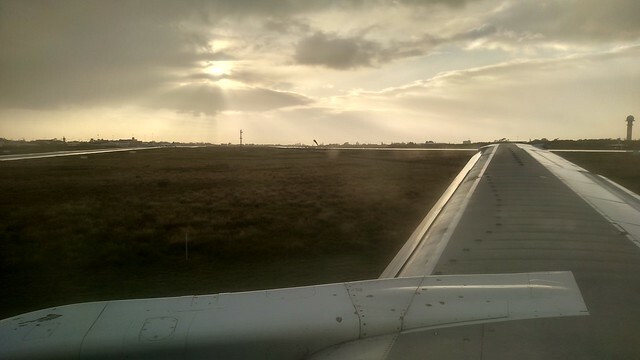 Eventually, we pushed back and taxied to the end of the runway. This didn’t take very long and soon enough we were airborne and climbing into the South Africa sky. Today’s flight was booked at around 1.5 hours, but the announced flying time was just over one hour. Not a terrible flight at all, and if this were a similar flight in the US, I would sit back put in my earbuds and zone out to music for the short hour. And while I did do this, there was a bit of a twist. 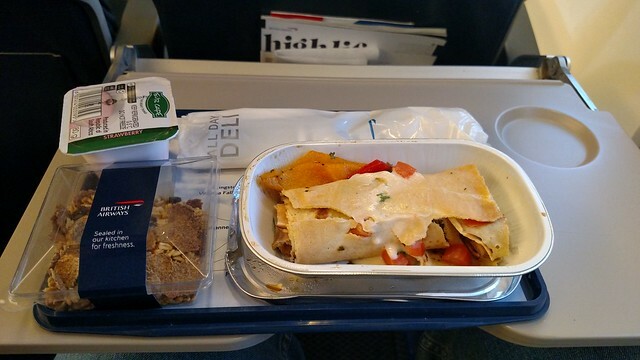 One thing I have discovered flying on shorter flights on foreign airlines, is that there are still many that do meal services in Economy Class. Even on this short flight, the cabin crew quickly got the carts out and into the aisles to begin the meal service. And believe it or not, it was actually a hot selection – what appeared to be a crepe with a side of yogurt and cereal. Simple, but definitely a nice touch! Add a cup of coffee and I was set. 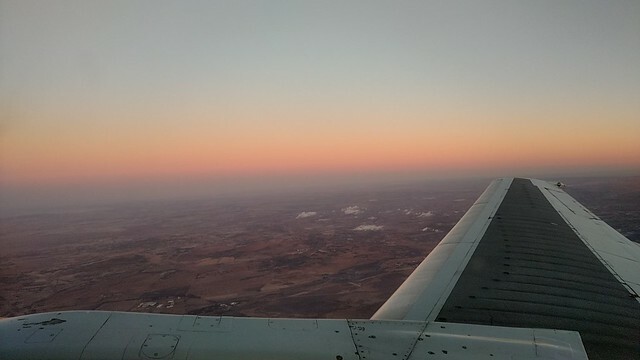 Even after clearing away trays, I still had about 20 minutes or so before we started our approach into Port Elizabeth, so it wasn’t even that I felt rushed. Of course had the flight been full, I’m sure this would not have been the case. For whatever reason, instead of feeling like early in the day, it felt like it was late afternoon. Perhaps with the way the lighting was outside or maybe for once I was jet-lagged. 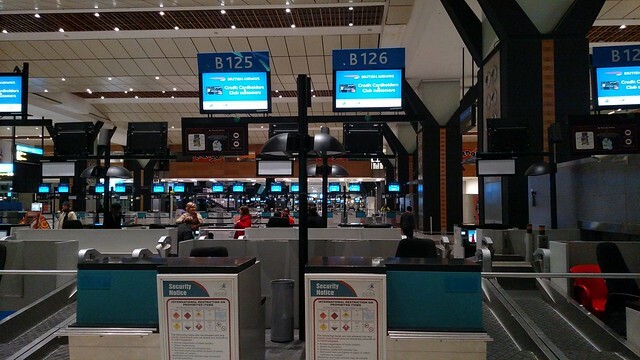 Either way, the plane touched down on time and taxied to the terminal in Port Elizabeth. It’s not a large airport and the only means of disembarking is via stairs – my favorite way to get on or off an aircraft! A short walk across the ramp brings you to the baggage claim inside, where given the number of passengers, it did not take long for the bags to be delivered. Oddly enough though was that when my bag came around on the belt, it had no tags at all. I’m rather thankful that my bag had not got lost and hopefully it had come off there in Port Elizabeth – but if the bag tag had come off say in Johannesburg I could have been very screwed. After all this was just day two of a 21 day trip with nearly everything that I needed in it and I didn’t have insurance. I think I lucked out there. 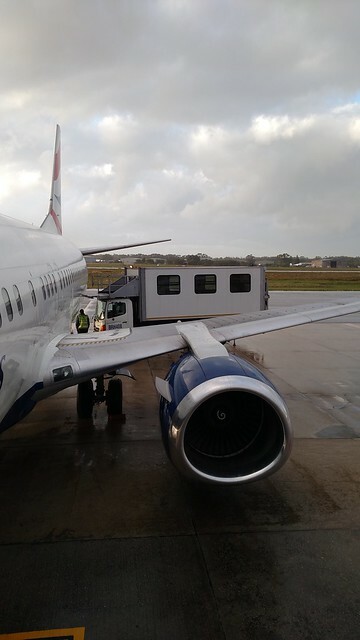 Overall I was very impressed with the service on British Airways operated by Comair. 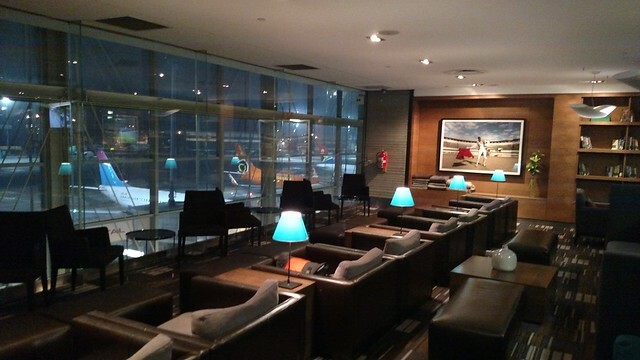 From the on-the-ground experience in the SLOW Lounge to the in-flight service it was very well run and presented. It actually has me curious about trying “regular” British Airways; obviously I would like to to their long haul Business Class, but that might have to wait until my post-Delta era (I’m sure that someday my loyalty to Delta will end and I think it may be sooner rather than later if SkyMiles keeps changing). Either way, I can say that I strongly recommend flying on British Airways within South Africa, especially if you have status within Oneworld.